The style of carving here is derived from a group of jade carvings that were known to the Qianlong emperor as ‘Hindustan’ jades. Geographically the term Hindustan refers to an area of northwest India including Kashmir and Pakistan, but it was used at the Qing court to include jade carvings from northern India, Turkey, and the Yarkand region, from which the flow of jade increased markedly in the period 1759 – 1799, after the extermination of the Zunghar empire (with the help of Muslim locals, many of whom were engaged in jade mining and trade). One of the qualities that the Qing emperor particularly admired was the paper-thinness of the Hindustan wares, which was partly an illusion created by purity of materials, the softness of finish, and clever use of multiple planes of carving, all of which, under the play of light, gave the impression of greater thinness than there was in fact. Not to be outdone, the lapidaries in the Beijing facilities strove to achieve ever greater thinness. By far the thinnest of the entire Hindustan group of jades were made in the palace workshops during the late Qianlong era or by fakers emulating them in the late Qing and Republican periods. The combination of the Qianlong emperor’s love of snuff bottles and of Hindustan jades allows a fairly confident attribution in this case to the Imperial workshop at Beijing, and possibly to the Xifanzuo or ‘workshop of the western border regions’. 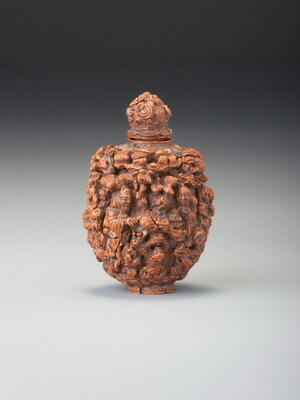 The material and workmanship are entirely in keeping with a late Qianlong date, and we are probably safe in assuming that this bottle was made between, say, 1760 and 1799, although a slightly broader possible date range has been given. For related examples, see Friedman 1990, no. 68 (white nephrite, with a somewhat similar design to this example); Hamilton 1977, p. 32, J.51 (a remarkable double gourd-shaped blue jadeite example of extraordinary quality that seems to confirm late-Qianlong Imperial use of jadeite at the palace) and p. 33, J.14 (an unusual nephrite bottle contained in a simulated pouch with Mughal-style decoration); Stevens 1976, no. 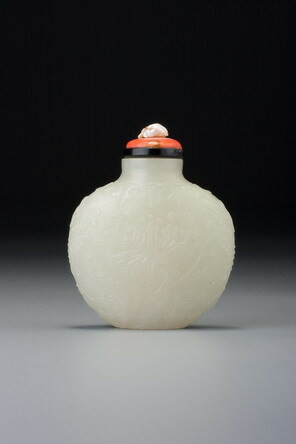 1013 (the extraordinary white nephrite, large Mughal-style bottle set on four feet which was one of Bob’s favourites); Hui, Polak, and Sin 1991, no. 130 (white nephrite with elaborate Mughal-style floral handles), and White 1990, p. 31, nos. 1 and 2 (two white nephrite examples, one of which is similar in form and decoration to this example).